Tracktion 4 is now compatible with another operating system. Following a period in the relative wilderness, the Tracktion DAW got new ownership and a welcome version 4 update for PC and Mac earlier this year. The good news has kept coming with the announcement that Tracktion 4 is now available for 64-bit Linux Ubuntu 12 systems, too. It becomes one of just a few music production packages (Bitwig Studio is set to be another) to be truly cross-platform. "Linux users, much like Tracktion users, have always been on the cutting edge of technology and willing to look beyond the status quo for alternative solutions," explained Julian Storer, creator and chief developer of Tracktion. "In that spirit, bringing Tracktion to Linux just makes sense. I'm extremely excited to open a whole new community to the joy of music creation in their preferred environment." Tracktion 4 is available for $59.99 for a new license or $29.99 as an upgrade from any previous version. 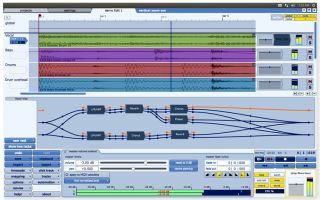 The Tracktion 4 Linux version is initially free during the current public beta phase.